"Hollywood Blvd., We're Doomed" (Detail) Mark Vallen 1980 ©. Starting March 12, 2016 and running through April 2, 2016, I will show two of my social realist drawings at Mi Ciudad of Los Angeles, a group exhibition at Avenue 50 Studio in Highland Park, L.A. California. Created in 1980, my drawings Hollywood Blvd., We’re Doomed and Hollywood Blvd., Punk Rules, portray the decaying urban landscape of Tinseltown in the late 1970s before it was transformed by waves of gentrification that began in the 1990s. 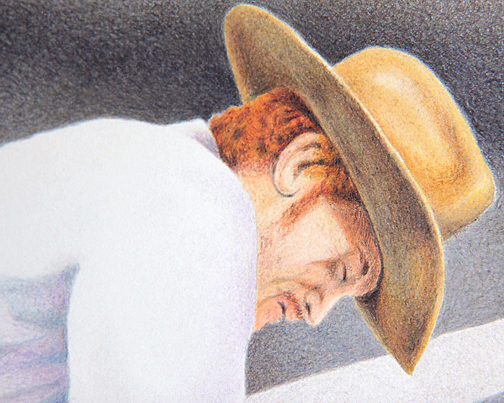 My drawings describe a hidden history of Los Angeles that I lived as an active participant. With the Ave. 50 exhibit, these artworks will have been exhibited only twice since they were originally created. A high resolution version of Hollywood Blvd., We’re Doomed, can be viewed on my Saatchi Art account; by double-clicking the artwork found there you will be presented with a strikingly detailed image. "Hollywood Blvd., We're Doomed" - Mark Vallen 1980 ©. Color pencil on paper 22"x29" inches. 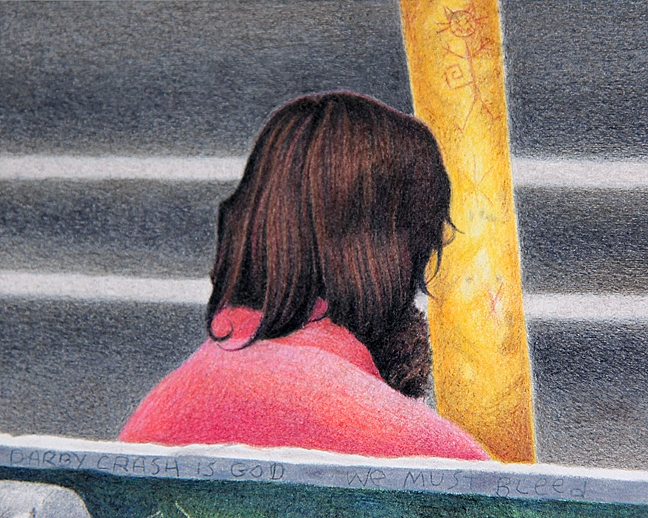 Hollywood Blvd., We’re Doomed was created with color pencil on paper. 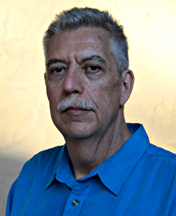 It is based upon sights I witnessed on the famous street as it became the nucleus for the punk rock movement on the West coast of the United States in the late 1970’s. The Masque, the first underground punk club in California, opened its doors in 1977. It was located in a dark, dank, windowless basement on Cherokee Avenue, a tiny side street off of Hollywood Blvd. I frequented that den of iniquity, and through my art began to document and promote the dangerous subculture that incubated there. 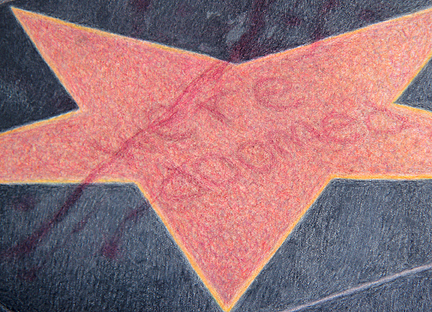 While Hollywood boulevard is internationally renowned for its Grauman’s Chinese Theater and the brass and terrazzo stars embedded in the sidewalks along the Hollywood “Walk of Fame,” in the late 70’s the street had fallen on hard times. Stores in the area had gone out of business, or turned to selling cheap kitsch to the tourists that never stopped flocking to the Mecca of the Hollywood dream machine. Instead of starlets, visitors were more likely to see drug dealers and their clients, male and female prostitutes, homeless indigents, and flamboyant transvestites. In that context, L.A.’s first punks found a home. In the midst of the boulevard’s regular population, a small army of colorful misfits hung around the Masque. We were enigmatic oddballs, inexplicable with spiky day-glow hair, bizarre clothes, “jewelry” of razor blades and safety pins, weird sunglasses and even weirder music. 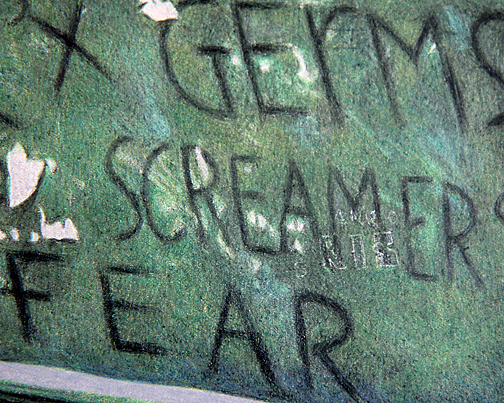 In We’re Doomed, I portrayed drifters loitering on a bus bench graffitied with the names of L.A. punk bands like the Weirdos, X, Germs, Bags, Screamers, Fear, Mau Mau, and the Plugz. 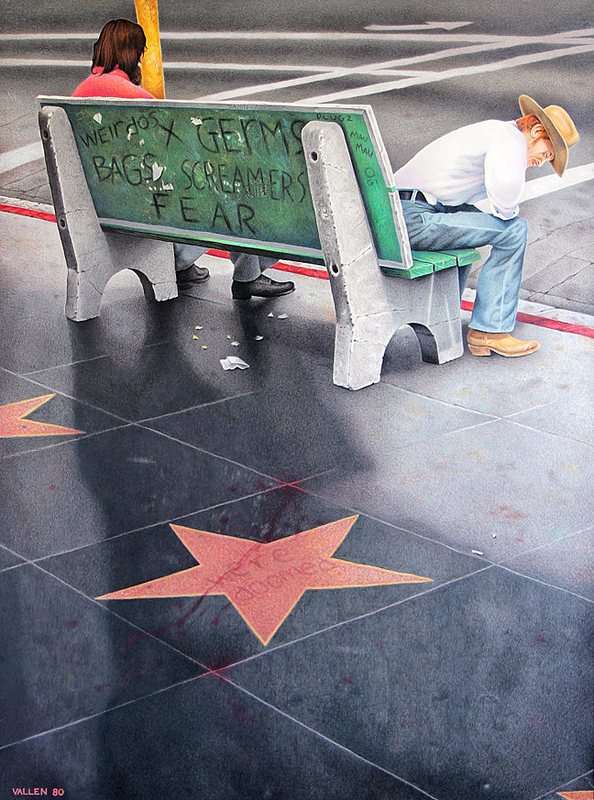 In real life the bus bench depicted in my drawing was around the corner from the Masque, and a nearby star in the Hollywood Walk of Fame was actually defaced with the nihilistic punk scrawl “we’re doomed.” It was a detail included in my dismal tableau, but also used to title the drawing. "Hollywood Blvd., We're Doomed" (Detail) Mark Vallen 1980 ©. "We Must Bleed." My drawing displays words etched into the bus bench that read “We Must Bleed,” the title of an apocalyptic song by the Germs. Not long after I finished my drawing in 1980, the 22-year-old frontman and songwriter of the Germs, Darby Crash, committed suicide with an intentional overdose of heroin. The Masque permanently closed its doors in 1979, but an uncontrollable movement had been unleashed. My second work of art in the exhibit is a 1980 pen and ink drawing titled Hollywood Blvd., Punk Rules; it also depicts a squalid scene on the boulevard. The work was drawn using a Koh-I-Noor Rapidograph technical pen, allowing me to create precise crosshatching and rich layers of transparent color. "Hollywood Blvd - Punk Rules." - Mark Vallen 1980 ©. Pen & ink on paper. 9 1/2" x 11"
The pen drawing portrays an elderly woman waiting for a bus; she is no doubt a resident in one of the many cheap apartments that existed in the area during those days. 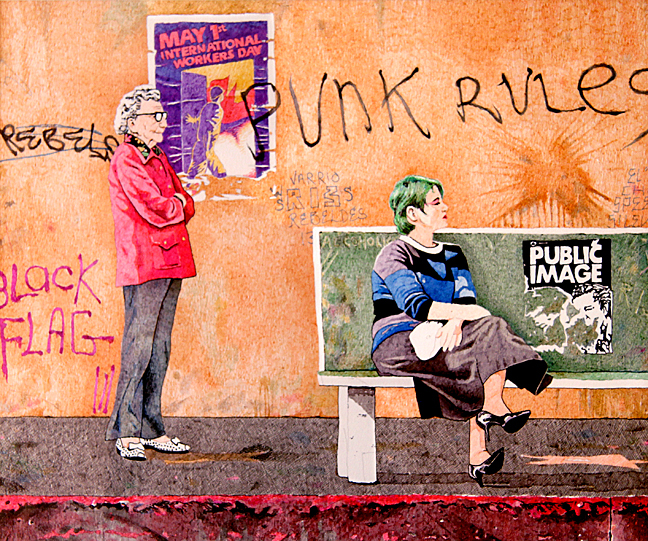 Sitting expectantly on a grimy bus bench is a young green-haired punk. At the time only a handful of miscreants dyed their hair in “anti-fashion” day-glow colors, it was a sign of extreme disaffection with society that guaranteed trouble; for the mobs of punk youth that called themselves the “Hate Generation,” that was A-Okay. The background behind my two characters is a Hollywood wall covered with the iconic hieroglyphics of the era, a mix of Chicano gang placas (graffiti) and punk defacements; note my inclusion of the legendary Hollywood “Walk of Fame” gold stars on the sidewalk. Two posters are included in the urban landscape; both were actually plastered all over Los Angeles at the time. The poster wheat pasted to the wall called for a militant demonstration at L.A.’s MacArthur Park on May 1st, International Workers Day. It was the first significant May Day event in the city since the 1960s, and it was attacked by the Los Angeles Police Department for being an unpermitted march. I was in the park taking photographs when I witnessed the mass arrests; I was almost trampled by two truncheon swinging LAPD officers on horseback. The peeled and ripped broadside on the bus bench announced a May 4th concert by the U.K punk band Public Image; I attended the riotous mêlée at L.A.’s rundown Olympic Auditorium that co-starred L.A.’s own, The Plugz. Curated by esteemed L.A. painter Raoul De la Sota, the exhibition features the works of eleven L.A. artists who with their works bear witness to the megalopolis that is the City of Los Angeles. Mi Ciudad of Los Angeles opens on Saturday, March 12, 2016, with an artist’s reception from 7 pm to 10 pm. The exhibit will run through April 2, 2016. Avenue 50 Studio is located at 131 North Avenue 50, in Highland Park, CA 90042 (View map for directions).